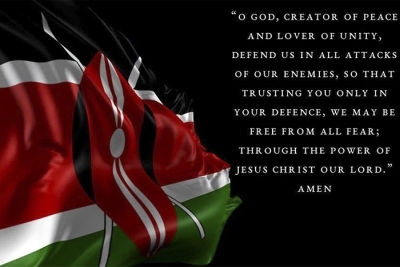 The Anglican Primate of Kenya, Archbishop Jackson Ole Sapit, shared this prayer meme on his Facebook wall following Tuesday’s terror attack in Nairobi. (PHOTO: Archbishop Jackson Ole Sapit / Facebook). This week’s terror attack in Nairobi has “left behind a trail of pain and untold suffering among innocent and hardworking citizens”, the Anglican Church of Kenya said in a statement. At least 21 people are known to have been killed after militants from al-Shabaab, a Somalia-based al Qaeda affiliate, attacked the DusitD2 hotel and business complex in Nairobi on Tuesday. A further 19 people are still unaccounted for. The terror group claimed responsibility for the attack, saying it was in response to US President Donald Trump’s decision to move the American embassy in Israel to Jerusalem. The 20-hour siege ended when security forces stormed the hotel, ending a 20-hour siege. They said that five all five militants who stormed the complex had been “eliminated”. Today (Thursday), police in Kenya arrested nine people suspected of playing a part in the attack. “We wish to convey a message of goodwill to all the citizens affected by the unfortunate incident”, the Anglican Church of Kenya said in a Facebook post shared by the Archbishop of Kenya, Jackson Ole Sapit. “It is our sincere prayer that those who got hurt will recuperate quickly and the Lord will console those who lost their loved ones. The statement continues: “as a country, we should remain steadfast in our commitment to patriotism and continue to uphold human dignity, common identity and belief in love. We must always remain strong and unbowed by events that seek to destroy the beauty of the human race. “We commend our security forces and emergency services for the quick and coordinated efforts they took to ensure that more lives were saved. Your acts of bravery and sacrifice, lived up to your call to defend the Nation. Upon you and your families, we pray for the Lord’s blessings and favour. “We further call upon all Kenyans to support those involved and affected by the operations by all means. Our Kenyans story is one of love and care. Our goodwill goes a long way in uplifting the spirits of those affected. When we hold each other’s hand, we uplift their spirit and that of the Nation. “God Bless You, God bless Kenya”.